Our new LED luminaires are ready – Benefit from our introductory discount! We introduce: New tube-like LED machine luminaires, a slim luminaire for tight space conditions and our RGBW-all-in-one-solution. 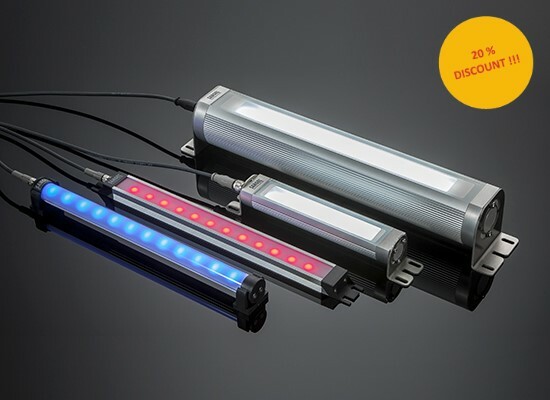 With our new LED machine luminaires LR40 and LR70 with a diameter of 40 and 70 mm we complement our product portfolio and enable the easy change of existing luminaires without any design change. Benefit from the identical position of the fastening elements and plan your new machine series with this new product line from the very beginning. In addition we present with the SL-type a slim machine light with attractive features, which is also available as the RGBW version. Thus you cannot just illuminate your machine, but also indicate machine statuses with different colours. The same is also possible with our ELN-series which is also available as the RGBW version. This all-in-one solution not only saves time and money, but also space. The ELN-RGBW therefore offers genuine added value. Take advantage of our campaign and benefit from additional discounts. Because from 01st of February until 31st of March 2019 new customers get a 20 % discount on the list price starting at one piece. This campaign applies just for the LR40, LR70, ELN-RGBW, SL and SL-RGBW. For questions about our products or our campaign please contact us at sangel@sangel.com.